In traveling parts of the United States during the family road trips of my teenage years, the maps and brochures from the National Parks were always interesting to me. They were of consistently high quality, contained interesting information, arresting photos and featured detailed maps with were both accurate (like the USGS topo’s I had some familiarity with) and had a level of finish quality and artistry that draws you in. The high quality brochures are not a coincident, they are the result of a long-standing commitment “to create media that effectively communicates National Park Service messages to the public.” It turns out that “since 1977 the designs of all new brochures have been based on the ‘Unigrid System’ format, created by designer Massimo Vignelli in collaboration with” the park service. The design only offers sizes which can be printed and cut to evenly divisible sizes based on the large sheets of paper they order for publishing. I believe that the largest map they produce (B6 in the image below) is 1/4 the size of the paper they use. Thusly, B4 is 1/6th, B3 is 1/8 and so forth. The park service offers detailed guidelines for developing literature based on their strict but effective grid system. They also do most of their high-end mapping and brochure design in a single central office in Harper’s Ferry. A specific in-depth article by the National Park Service describes the creation of a new National Park Brochure for Glacier Bay National Park. 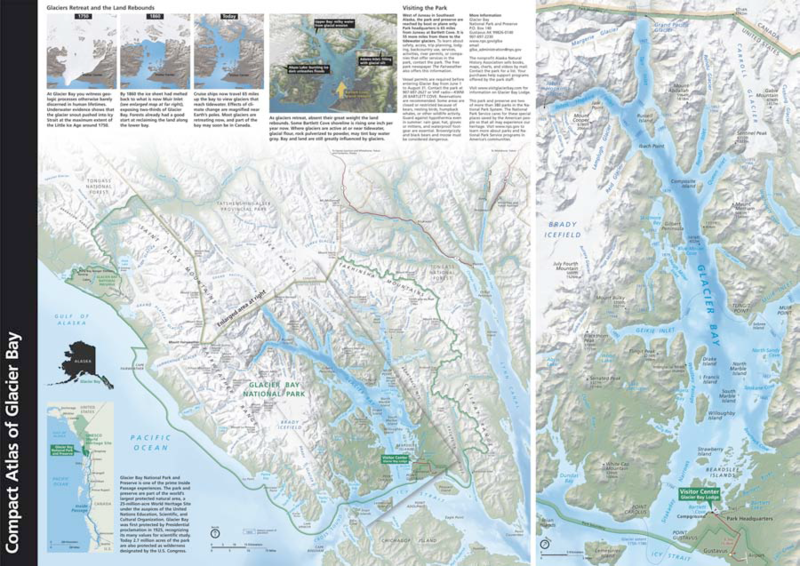 The article calls out that to make the map, their team collected “input from staff at the park” They further went on to describe their research into the primary usage for this map: “Ninety five percent of visitors to Glacier Bay arrive on cruise ships, never set foot ashore, and are older than the general population of park visitors—thus, large map type is a design necessity.” They also call out “observing visitors using the map”. Further, the map was not made by just one person, but “a collaborative effort between a writer, graphic designer, and cartographer”. It is interesting to see how the project managment of a detailed map is so similar to the process we use in building software. Research, planning, development, research and refinement are the same steps we follow. I also learned more through this article about the purpose of each side of the maps that they create. “The front side of the brochure, which includes the cover, is generally devoted to introducing the park and outlining broad interpretive messages by means of photographs, illustrations, text, and the occasional small thematic map. The second side of the brochure, containing practical visitor information including the map, is more subject to change.” I did not realize that they deliberately separated the content by sides based on the likelyhood that the information would need to be updated. Since the park service is a government agency, everything they do is in the public domain. They offer the illustrator/photoshop files for all of the national park system maps free to download. A review of the Unigrid system. I am amazed, but I cannot find anyone on the web that specifically collects national park maps/brochures. I thought someone out there collected everything. I think this is fate – start collecting, Sir Thomas! mdbran: I am not sharing the illustrator file, but I am thinking about printing a small batch of posters for sale. Would you be interested in a poster? Yep. When are you doing it and where do I send the money? I’ve been collecting brochures for a few years now- I probably have about 40 different ones from my travels across all 50 states. I have been collecting Unigrid NPS brochures for a few years now and have a good sized collection with many duplicates, especially east coast/DC region. Would be happy to trade with others. I love visiting National Parks and two things I always do is obtain a copy of the brochure and get a stamp cancellation on my National Park Passport to record the date I visited. I am also surprised there isn’t more websites devoted to this collection. I collect the unigrid brochures, have over 2000 of them- so am interested in meeting fellow collectors. I also am trying to create a database/spreadsheet with pics of all known unigrids. Does anyone know of a list of all the unigrids? i am not aware of any lists of that sort, although i hope that someone makes a list with each park and known versions to aid collectors. My dad collects these, and has to have around 100 of them now. I took him to DC this weekend and he added a lot more. I found this index that has every version of all the unigrids, I think. It’s just the front cover though. Does anyone know if you can download pdf’s or files of the unigrids? I have a large collection and enjoy expanding my collection by trading duplicates. I also have excel lists of all the nps unigrid style brochures that I am aware that exist. For brochures I have, the lists contain scans of both front and back covers. For items I do not have, just an image of cover is used. Also … there is a club, http://www.parkstamps.org. If you join the club you have access to the clubs list of NPS unigrids. The clubs lists are out of date, except for the “Other Unigrids List” which I updated for the club this past spring. The club is very stamp focused, but you can still get some good park and unigrid information from this site. Does anyone know if there is anywhere online to purchase NPS brochures? Wanted to get a few for parks I visited years ago but never got brochures while I was there or lost em over the years. @Steve, you can’t buy them, bu if you call or email most NPS offices, they will send you the brochure in the mail for free. Great article and yes — I’m another person who has been collecting brochures and old books about our National Parks. My special focus is Yosemite National Park. I have found a wonderful place to find these old brochures and books is at thrift stores and yard sales… sometimes at estate sales just asking opens a whole world of treasures which otherwise would be thrown away. Jamie – to answer your question about brochures – you can find current brochures online by entering “Brochure, National Park….” and then the name of the park. I am absolutely delighted to know that there are people out there that collect the NPS and other Unigrid brochures. The NPS brochures, and really the NPS as a whole now that I start thinking about it, really are a step above when it comes to design. It’s impressive, and something I’m happy to support. I couldn’t agree more – not only does the NPS run great facilitates that protect and help us learn about America’s greatest natural and historic locations, but they do it with this crisp, clean style which is reflected int heir literature and signage within the parks. I’m personally curious to see how they handle the transition to digital literature, and augmented reality experiences. The next 10 years could be very interesting. This is so unrelated to the current topic for which I’m commenting on, and I do apologize, however I came across some of your articles regarding Legos and for some they were very useful as for others they confused me more. My son is now 13 and he no longer plays with his Legos so I researching on how to price them when reselling. I really would appreciate it if you could help and email me so I’ll have a way to contact you and ask a few questions. My main questions are regarding the little figurines, because i have several from Star wars, the storm troopers, Ninjago and I have no idea what else. Thank you so much. As far “someone who collects them…” I am part of an online club called the National Park Traveler’s Club (parkstamps.org). Many of the members individually collect the NPS unigrids, and the club maintains a “unigrid clearinghouse” where members with extra folders can mail them to members who need a certain site’s unigrid. Might be worth looking into if you’re starting a collection.